At 8.30pm this evening, the Formentera Council held its official Diada de Formentera celebration. The gala honoured individuals or groups determined by unanimous vote in CiF plenary to be worthy of distinction. 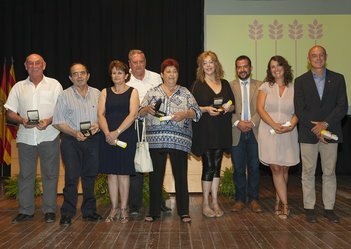 2017's gold medal (la Medalla d'Or) went to Formentera's community of professional health workers. The award salutes the work of individuals employed in a diverse array of positions like support, treatment, care and wellbeing, not least for their work and dedication as executors of the universal right to health. Three Sant Jaume awards (premis) were also handed out. Pilar Castelló Ramon (Sant Joan de Labritja, 1953), for one, was praised for her work in the public sector. After holding the distinction as the first career civil servant in Formentera's local administration, Castelló worked for 25 years as a teacher, speech therapist and director Mestre Lluis Andreu primary school prior to retirement. The accolade was also given to Club Dojo Formentera in recognition for their efforts introducing martial arts on the island. After starting with judo in 1982, the dojo grew to include aikido, jujitsu, karate and kendo, keeping their focus fixed on values like personal improvement, camaraderie and hard work. La Fonda Rafalet, a family-run inn with more than sixty years of uninterrupted service, came away with the evening's third Sant Jaume prize, a celebration of the Rafalet crew's ability, generation after generation, to adapt to the changing needs of an evolving brand of tourism. This year's adoptive son honour was given to Manu San Félix (Madrid, 1964). In addition to his research and dissemination work on underwater environments, and a career that includes reporting and professional photography, San Félix, a biologist, was commended for his efforts to raise awareness about protecting posidonia meadows. A closing address by the chairman of the Council highlighted the fortuitousness of coinciding with the administration's ten-year anniversary this year. On that note, Jaume Ferrer noted the event shared a birthday with another local institution, the Formentera hospital. To the CiF chair, “this is really a case where we can talk about a before and after in terms of variety and quality in locally available healthcare services”. Urging audience members to look back at past Medalla d'Or honourees, Ferrer said this year's awards were a chance to “recognise all the people who have toiled to strengthen what has often been an under-resourced service” and “everyone who has worked, and who continues to work, to improve medical care on our island”. After thanking each of the evening's honourees, Ferrer took the chance to highlight another banner event this year: 2017 is the year of sustainable tourism. The CiF chair stressed the need to preserve Formentera's undersea environment, calling it “the most profitable investment we can make”. Miquel Tur and Júlia Benevelli's musical duo Sweet Lure closed the evening gala. This year, the official Diada de Formentera graphics were upgraded to mark the Formentera Council's tenth anniversary.